Nina Simon, an author and consultant who helps museums get the public involved in designing exhibits (see profile at Smithsonian mag or her blog), chatted last week with Andrew Taylor (Director of the Bolz Center for Arts Administration) in an online talk show about museum business models (pic at right). Museums could take a page from public media and public radio, Simon said, where sponsors/members might make a museum available to the public for free. Simon says there needs to be a move away from memberships based on a discount transaction model (i.e., members get in free), and instead memberships should emphasize that members make the museum available for everyone else. Simon has previously written about rethinking membership and admissions (see a few of her articles, and her Feb 2011 post on switching from ‘value’ to ‘affinity’ membership programs). In addition to funding after the fact, some virtual exhibits may be able to crowdsource funding beforehand to create an exhibit. The Kickstarter funding platform (for artists, designers, filmmakers, musicians, journalists, inventors, explorers, etc. ), has received over $53 million in pledges for various creative projects. There are other analogies as well, such as a shareware software. But shareware is purely a form of donation/payment, it is not specifically earmarked to make access available to others. Also, see my post about revenue models of open access journals. The cost of creating a virtual exhibit could range from $5k to $100k, depending on the richness of the content and whether a lot of interactive and video content is created from scratch. Maybe a project could collect $5k using Kickstarter, another $20k in individual payments, and $30k in sponsored payments — yielding access to 120 thousand visitors? After 10% fees to Kickstarter, and an app store’s 30% commission, that would be $39,500 in revenue, plenty for a create an interesting, informative, interactive, virtual exhibit. Do you know of virtual exhibits using crowd-funding strategies? 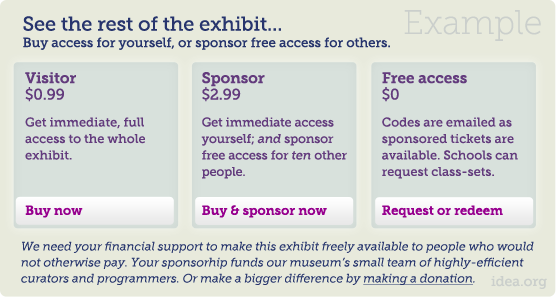 Will members of the public pay a little extra to sponsor a virtual exhibit for strangers? Should sponsored payments be pure donations, or tied to a specific number of free uses? Update: 2-May-2011, clarified Nina Simon’s comments. 2 comments on Are public supported (crowdfunded) virtual exhibits possible? Definitely don't think you're dreaming. I think as and if museums make the shift from their traditional platform to SaaS platforms for, say, art collection management, online exhibits could very well be free or just be a part of their normal application subscription. So, that would make creating virtual public exhibits from an existing collection just a matter of a few clicks. Of course, the profit motive will always cause problems there! IDEA » What is Crowdsourcing? And how does it apply to outreach?